St Anton is one of the best-known ski resorts in the world. It's part of the history of skiing, with the technique developed in the area in the 1920s being the basis for ski instruction for many decades afterwards. Ski films shot in the area helped popularise the sport both pre- and post-war and the premier position in the world of skiing has been maintained by the famous World Cup events and the World Championships held here in recent years. St Anton is a busy bustling resort which is these days more of a town than a village, but it is a town which is dedicated to winter sports. Lifts are convenient, spread out along the edge of the built-up central part of the resort, and whisk the skier up into one of Austria's largest areas extending up and over the Arlberg Pass. The homeward run after a day out over at Stuben or up on the slopes below the Valluga can either be finished off with some final bumps or with a stop at one of the welcoming watering holes at either side of the main drag back to the resort (it's tough to say which is most potentially hazardous). Keen skiers will love the access to a second large ski area above Lech and Zürs (and a third smaller one above Klösterle) while those who are looking to burn the candle at both ends will find enough options to keep them going way into the early hours of the next day. St Anton features in all package ski holiday brochures and is one of the few resorts in Austria to have an extensive chalet selection. Those who are looking to make their own way will find it a simple matter as the resort is served well by transport options (see the Hotels and Travel tabs above for details about booking your own accommodation and making your own way to the resort). 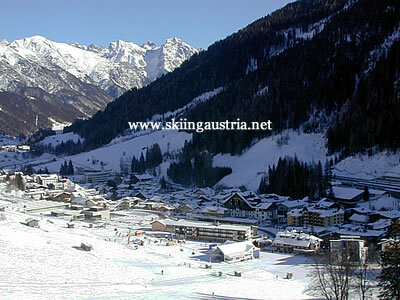 Location: St Anton is part of the Arlberg region and situated on the Tyrolean side of the Arlberg pass. Access: There are plenty of options for getting to the resort, with a main line train station, an express road and a road tunnel under the pass for those coming from the west. Most skiers head up onto the slopes on the northern side of the valley in the morning, which can lead to some queues despite the improvements in capacity over the last few years. The main area above St Anton is the Gampen which is served by lifts from Nasserein and the resort centre. Once above the trees, the slopes open out into relatively undemanding red and blue runs which are favourites with ski school classes. The second area on the northern side is the Galzig, which is reached by one of St Anton's most modern lifts from the resort centre. This section offers the option of heading over to St Christoph or taking the lift up to the Valluga. The ski area above St Christoph and over to Alpe Rauz has a good choice of mainly intermediate runs above the treeline. The descent from Alpe Rauz into Stuben emerges abruptly onto a village (and a chairlift!) which appears to be stuck in a timewarp. However the lifts above Stuben open up some of the most enticing terrain in the area, with good red runs off the back side and back down to Alpe Rauz as well as a selection of off-piste powder runs off both sides of the ridge. The other St Anton ski area is the Rendl, which tends to be ignored by daytrippers but is well worth spending some time exploring with long and sometimes challenging runs in the sunny bowls. One of the big attractions of St Anton for the good skier is the availability of the off-piste runs. There are a number of areas with attractive gullys and slopes: notably the Rendl; the area above Stuben; and the valleys under the Valluga. However it should be noted that all of these areas are potentially dangerous and great care (and preferably a ski guide) should be taken if planning on skiing some of the slopes. The St Anton - St Christoph - Stuben ski area has 38 lifts with 120km of ski runs. The multi-day lift pass also covers the Lech - Zürs area (now extended into Warth from 2013) as well as the Klösterle ski area, the Sonnenkopf. A day pass will cost 54.50 Euros in the main season. A six-day pass will cost 289 Euros in the main season. Cheaper price dates are available for the pre-Christmas period and from the last week in March. People do learn to ski quite happily in St Anton but it is not really a resort which is perfect for beginner skiers and families. Those who are just starting out will find themselves missing out on a lot of the advantages of the ski resort while still paying the price for the access. Beginners who are part of a larger group of skiers and who appreciate nightlife would have a good time - otherwise there are better and cheaper resorts for learning to ski. Intermediate skiers will enjoy St Anton if they are confident and especially if they are looking to improve. It's not a resort which is suitable for timid skiers or those who don't like lots of people on the slopes around them. But the scope of the area and the 'big resort' atmosphere may well inspire other skiers who are sampling it for the first time. St Anton is still probably the best resort in Austria for advanced skiers. There are tough bump runs, great powder areas and, for those who know what they are doing, some intimidating off-piste routes (plenty of guides are available in the resort). St Anton is as much of a 'ski hard, party hard' resort as its French equivalent of Val d'Isère. St Anton may only have a permanent population of around 2500 inhabitants, but that is augmented in the winter by an extra 9000 beds for guests. What was originally a lower and upper village has been extended and empty areas filled in, so that the resort has more of an atmosphere of a ski town. All types of accommodation can be found in each of the areas. However, the upper part tends to have more apartment accommodation and Nasserein has traditionally been a slightly cheaper option with more guesthouses. Those looking for a more exclusive option than St Anton might like to try St Christoph. The small village is located just below the Arlberg Pass and offers quick and central access onto the slopes in return for relatively high prices and little in the way of resort nightlife or atmosphere outside what is available in the accommodation. Those looking for cheaper alternatives might take a look at St Jakob, St Anton's neighbour a little bit further down the valley and with ski bus access. The search box to the right (or below if you are using a smartphone) gives an availability check for particular dates for all of the accommodation in St Anton. One of the great attractions of St Anton is that not only is it one of the world's top ski resorts but it is also extremely easy to get to. It sits right in the middle of a whole range of airports in three different countries, is on one of the main rail lines through Austria, and the only real geographical hurdle - the Arlberg Pass - can be avoided with a road tunnel. Zürich and Innsbruck are probably the choices for most people who are heading for St Anton: Innsbruck for its range of charter flights and package holiday providers and Zürich for the range of scheduled services and the transport connections. Bodensee (Friedrichshafen) and Allgäu (Memmingen) airports are both options for low-cost flights, while Munich and Salzburg might not be the first choice they are within a decent range if flights are more suitable to those destinations. The train connections are on the main line between Austria's western province, the Vorarlberg, and Innsbruck and the railway station in St Anton is a short walk away from the centre of town over the main road. For those who want to make the journey by road, there are a number of options for airport transfers from Zürich, Innsbruck and Munich. Transfer operator Arlberg Express, based just over the Arlberg Pass from St Anton offers reasonably-priced transfers from Zürich during the winter season, although these are infrequent outside the weekend. The Arlberg road tunnel (toll payable) avoids the Arlberg pass if drivers are coming from the west. However St Anton is reasonably high at resort level and drivers should ensure that they have appropriate winter equipment for their vehicle. Arriving from the west, St Anton is the first exit after the tunnel. Those arriving from the west will be using the Inn valley motorway up to Pians, where the road splits for Ischgl or on to St Anton on the express dual carriageway. St Anton is the last turning before the entrance to the Arlberg Tunnel. The ski season opens for winter 2018/2019 on 30 November and runs through to 28 April.